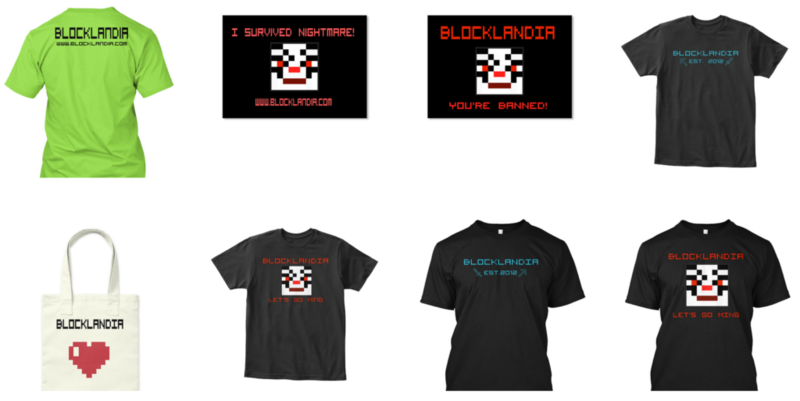 We’re selling Blocklandia shirts and stickers to help pay to keep the server online while also giving you something to wear and show your Blocklandia pride! All shirts are available as both t-shirts and hoodies. If you have an idea for a shirt, let Aguane know! If you want to support the server but don’t want anything in return, head over to our Contributions page for information on how to do that. These items print once a week and ship after printing (expect it to take a couple of weeks). International shipping is available. Stickers are $6.00 each, the tote bag is $19, kid size t-shirts are $19, adult size t-shirts are in the low $20s (depends on the style) and hoodies are in the $30s. Click on the image below to be redirected to our Teespring site and see specifics. This link should also give you 10% off your purchase, if it doesn’t – let Aguane know. How can I teleport to another player?